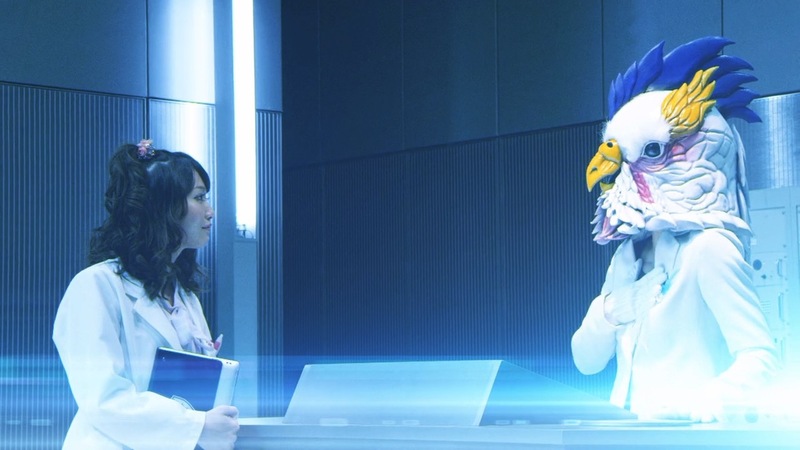 While Toei tokusatsu hero crossovers have become fairly commonplace these days thanks to the annual Super Hero Taisen movies, every so often one rolls around that promises something really special. The Tokusou Sentai Dekaranger and Space Sheriff Gavan crossover Space Squad: Gavan vs. Dekaranger is undoubtedly one of the most anticipated events in sometime – bringing together these space-faring heroes in a crossover that not only sounds good on paper but also makes perfect sense continuity-wise as well. 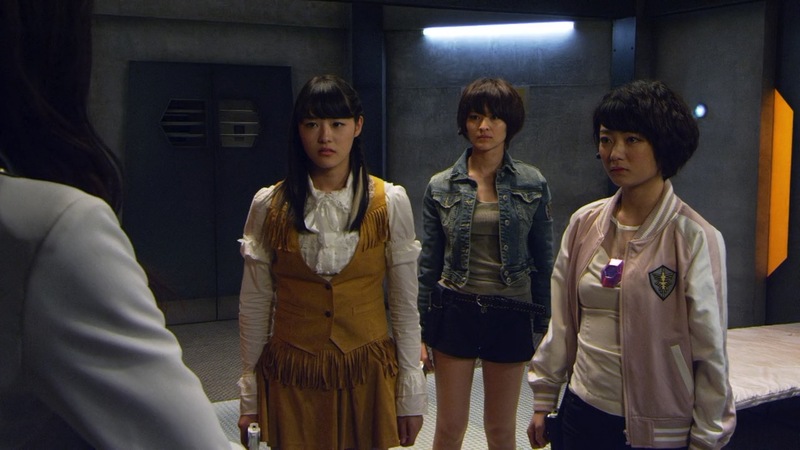 But before we get onto the main action there’s also Girls in Trouble: Space Squad Episode Zero – a prologue V-cinema release starring Jasmine/Deka Yellow and Umeko/Deka Pink as well as the new Space Sheriff assistants Shelly, Sisi and Tammy. Waking up in a strange place, Jasmine, Umeko, Shelly and Tammy are being hunted by a feral alien. No matter what they do every outcome leads to the same eventuality – their deaths. However each death leads to them waking up in the same place once again, repeating events over and over until they can defeat the monster and break the time loop. Meanwhile the Galactic Police are putting together a team for a special mission to rescue their President, who has been captured by the reformed Genmakuu. If the recent Kamen Rider Brave special has taught us anything, it’s that children’s tokusatsu can get a lot more violent when detached from its usual Sunday morning television slot. Whether that violence is warranted however is a different matter entirely. Girls in Trouble opens less like the sci-fi space cop special it is and more like a J-Horror survival film, as we watch the leads run around cramped corridors – dripping in sweat and wearing the shortest shorts possible as they’re repeatedly killed. The means of death aren’t especially gruesome, but the Kamen Rider Amazons-esque blood spurting is enough to remind you this is no picnic. The obvious fetishisation of the whole sequence should come as no surprise when you see the director is none other than Koichi Sakamoto – a man whose talents for great action sequences are unquestionable but does have a knack of letting fan service get the better of him at times. But in spite of the somewhat sleaziness of this first section, the film does a lot of good with its characters and setting – going as far as to even play up some of the viewers’ expectations based on previous films. We expect the Horusian alien with the creepy laugh in the darkened room to be the villain based on a similar villain appearing in the Next Generation Sharivan/Shaider movies, but then the film goes and subverts that by revealing that Birdie is just adverse to light and her “evil laugh” is her species equivalent of hiccups. Genius, even if the costume is just as ridiculous here as it was there. While it’s a pity Sisi isn’t more directly involved with the action (although there is a good reason for that), the characters immediately work together brilliantly – to the point where it doesn’t even feel like this is only their first meeting. Jasmine and Umeko are both on top form, and after 13 years it feels like the pair have just kept getting better and better over time. Umeko especially, who between this and Dekaranger: 10 Years After has established herself far beyond the cutesy, bath-loving persona she’s usually lumped with. Meanwhile Shelly, Sisi and Tammy all a decent amount of focus in their respective films but the chance to see them without the action focused on the Space Sheriffs shows not only shows just how brilliant all three of these characters are, but also how perfect they would be for a full Metal Heroes television revival. Toei has lined up an absolutely brilliant cast for the new generation Space Sheriffs, yet for the most part have barely been used. It isn’t until the halfway point that the film shifts back into familiar territory, feeling far more like a typical Sentai/Metal Heroes film but at the same time becoming a lot less interesting because of it. 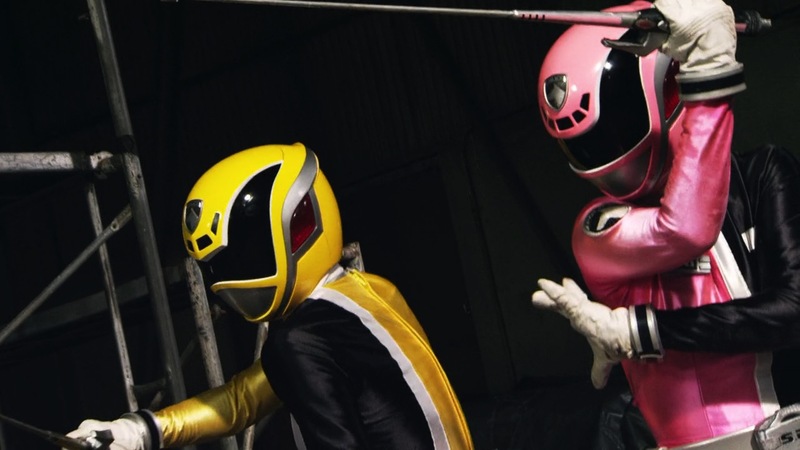 The action takes both the Dekarangers and Space Sheriff girls off in different directions instead of further developing the great teamwork they’ve already displayed, bringing them back together at the very end for a humorous resolution. The shift in tone feels fairly dramatic compared to the scenes that came before, even moreso when the “Girls in Trouble” theme starts playing over the Deka pair’s first transformed fight sequence. Even though they’re well connected the two halves of the film feel completely at odds with each other tonally, and as much as the plot wants to suggest otherwise the brutality of the first wasn’t necessary to prepare the characters for the second. Additionally Jasmine and Umeko’s transformation into Deka Yellow and Pink should feel like some long-awaited moment, but with the rest of cast not having any sort of transformation to rely on they instead end up feeling a bit out of place. By this point they’ve both proved themselves more than capable of holding their own without relying on the licenses, and the film itself has set a precedent for great action scenes that don’t rely on them either – so why bother? For many it might feel obligatory that a movie starring Super Sentai characters include their ranger forms, but Girls in Trouble doesn’t need them to be a success. If anything including them only really serves to show how much more interesting the Space Sheriff characters are, as they manage don’t have or require the luxury of transformation to get the job done. However the most commendable thing about Girls in Trouble is it's proper dedication to keeping an all-female cast. While surprise cameos from the likes of Doggie Kruger and Juspion's Mad Gallant are always welcome, the story completely revolves around the shows respective female casts and not once do the males ever gatecrash the party. Even the plot comfortably removes this unwanted and unneeded element from the film, cliche as it may be. Despite the unnecessary brutalisation and fetishisation of the whole affair, Girls in Trouble: Space Squad Episode Zero is still a fairly enjoyable film that not only highlights two of Dekaranger’s best characters but also gives the Space Sheriff girls to shine away from their metal-clad partners. 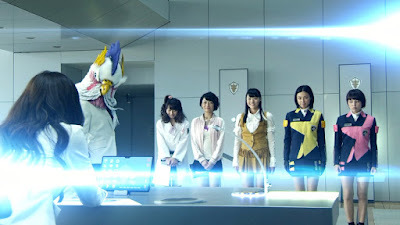 The minimal use of suit footage makes it a unique entry among Super Sentai productions, and if anything the film could have easily done without what little it had just to have these characters working together more. Problems aside, these franchises have been in dire need of more female-led stories for decades and it’s great to see this finally start happening. Just maybe a bit less of the fan service next time please.